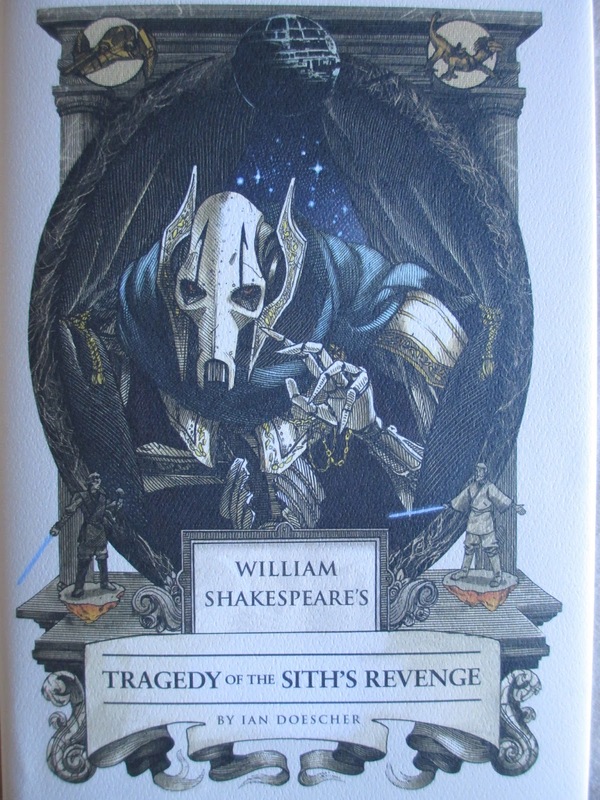 From the title, I somehow was thinking that this book too place after Episode VI, though I quickly learned that it is in fact between Episodes IV and V. I also had a sort of a shock when I read the first paragraph: this is the first Star Wars book I've read that's written in first person (Luke's perspective). I don't know why it should feel weird, but it did take me a moment to get used to. In fact, so did a certain something about the writing style combined with the content or technique. There's something just a tad familiar about the way certain passages are written that takes away from some of the fantasy aspect of the Star Wars universe. However, this is a mild complaint: otherwise, I rather enjoyed this book. As compared with A New Dawn, reading this book everything felt more relevant, perhaps because I already know more about Luke than about Kanan--he's more familiar, as is his entire character arc. Though there are essentially three trips Luke makes in this book (each one a little longer and involving more steps than the one before it), what is really crucial are the little things he picks up along the way. He is learning about this new world he's stepped into and about the people in it and taking those observations and applying them to his attempts to learn more about the Force. They're small things he learns but significant things--and even small things are interesting to watch him learn. It reminds me of when I was still watching the original trilogy for the first few times, back before I'd seen it dozens of times--that newness. I don't think this would be considered a spoiler. Nakari's character. I quickly realized that she would either die in the end or would turn out to be a traitor. And, um, the end of this book was sad; in fact, last night I watched the end of Season 5 of The Clone Wars and today I finished reading this book and overall I think it was just a tad too much Star Wars tragedy for me to handle all at once. Anyway. What I appreciated about how this book ended was how it set up reactions. The characters' reactions, I mean. Characters are faced with the choice of how to react to things. Anakin was faced with the possibility of death and he let his fear of death destroy him. But when Luke is faced with tragedy, he knows how to handle it. So there is the irony that Luke is seeking to become a Jedi like his father--but he will not make all of the same mistakes that his father did. And this in turn is what brings Anakin back from Darth Vader in the end. Ah, lovely stuff. 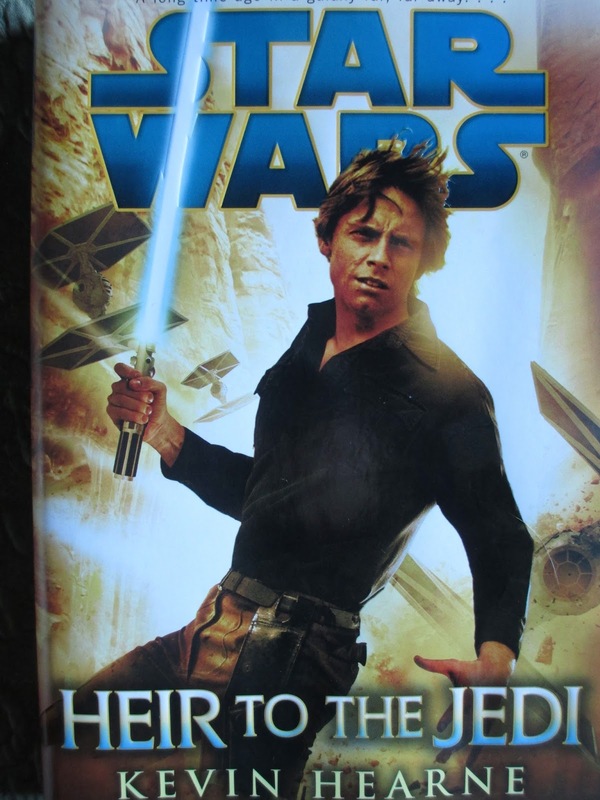 Anyway, this was my favorite of the three Star Wars books I've read so far after the novelizations. It drew me in quickly and kept my attention, despite my mild complaints about the style at times. May the Force be with us, even when we have no one else to tell us how to find it. Tonight was a time of light and dark. I watched the moon rise from the horizon, bright and yellow, and then become slowly covered by shadow and turn reddish orange. And then I watched the season 5 premiere of Once Upon a Time and watched Emma slowly edge toward the dark. I have emerged thinking that the two, the moon and the episode, are one and the same. The moon was better than last year's because it was earlier and I was therefore able to see it (for the most part) from start to finish; last year I left while it was still red. But it seemed also not as good as last year's because I found it not quite as red--but maybe that's because I had already seen it before and so it was no longer a new effect. Either way, it's still a fascinating scene to watch, very beautiful. OUAT probably had one of its best season premiers: I had grown used to the idea that the first and last episodes of each season don't tend to be the best episodes. But I rather liked last season's final episode, and this first episode showed general promise. I wasn't expecting the link between the dagger and the King Arthur plot, and Emma's growth to darkness will be interesting to watch--though I was expecting a little more Swan Lake in this episode because of the title. The "we've lost our memories again" bit was a little too repetitive, though of course I know it's the plot again so that there can be flashbacks again. I just sometimes wish things didn't have to be so formulaic. Anyway, it should be entertaining to see slowly, episode by episode, how Emma turned dark. But you know, the thing about darkness (or general changes in color) is that they tend to sweep back away again. The moon gets covered in shadow, the shadow fades into red, the moon disappears entirely except for a little blur, and then the light reflects once more across the moon's surface. So it will be with Emma--it just might take a little while for her to get there. I know, it's a bit soon for another chocolate review and if I'm going to be doing another chocolate review, I should really finish up with the rest of my San Diego chocolate loot. But I had this quick review right here, so I thought I'd better just put it up now. And believe me, it is quick. I've been slowly making my way through Numi's Indulgent Tea line, liking some of the offerings more than others. But I generally like Numi; as you can see, this tea is both organic and fair trade, meaning I can continue drinking it under my new resolution. (It was strange: I was staring at the teas at World Market when I had one of their $10 coupons and I realized that there were a couple of flavors there that I still kind of wanted to try but that I wouldn't be able to get anymore.) This tea blend, Chocolate Rooibos, is composed of cocoa powder, rooibos, honeybush, and vanilla beans. Rooibos and honeybush have been a pretty popular combo lately. While I enjoyed the Trader Joe's blend of the two, I think I'm starting to get my fill of rooibos. I think I can only handle it at all when paired with honeybush: it just doesn't appeal to me much on its own. And this tea is basically just another rooibos and honeybush blend. The vanilla softens it out to be almost sweeter and a little less rich. But despite being the first ingredient, I can't see that the cocoa powder does much at all. Especially after adding a little (almond) milk (which seems necessary to this type of tea), there's hardly any chocolate flavor, if any. It's more of an earthy taste that the cocoa powder gives than a chocolate taste. It's a pleasant tea with a hint at sweetness, but I don't think of it as a chocolate tea, which is disappointing because that's what the box promises. It doesn't really stand out to me on any other grounds, either, given the popularity of rooibos and honeybush blends lately. So while I've already finished off all but one of the dozen tea bags, I'm going to give this blend a general no: it just wasn't quite successful. 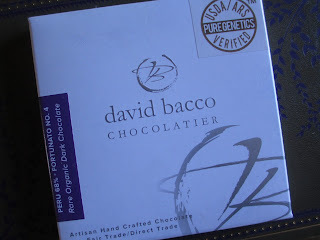 Last year I picked up two chocolate bars by David Bacco in San Diego; this year I only chose one more since I already had a lot of other chocolate products to try out. Once more, these are purchases from Rust General Store in the Old Town Historic District--which is absolutely the best. 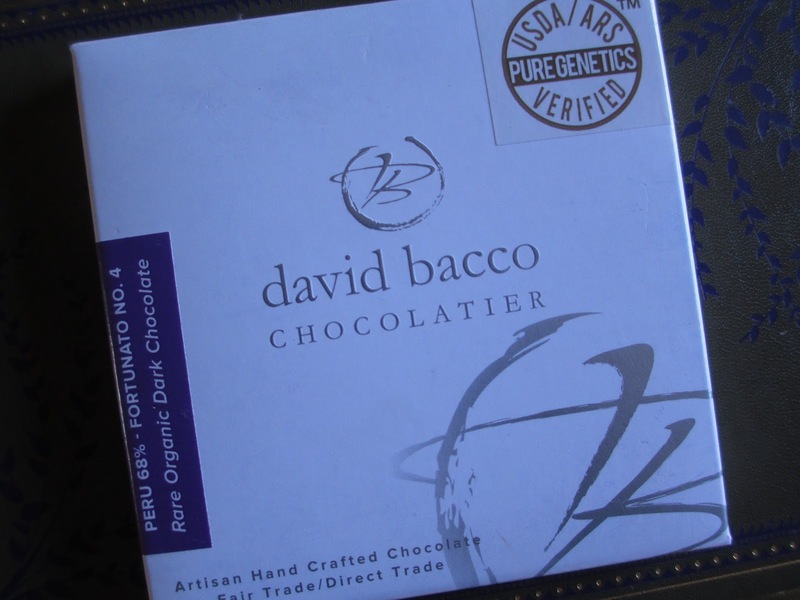 As a reminder, David Bacco is a chocolatier in San Diego and not only is this bar fair trade, it is also marked as "pure genetics verified," a particular phrase/sticker I haven't seen before. There are only three ingredients: cacao, cocoa butter, and cane sugar, all organic (note that there is no vanilla). A good starting place. Price-wise, these bars fall toward the pricey side but are still perfectly reasonable, all considered. To try out something a little different, I got the Peru 68%; inside the card box is a little white card detailing the crop number, harvest date, and cacao bean profile (they're an heirloom variety). Normally this isn't a cacao percentage I reach for, though the flavor notes did sound appealing. "Spicy-acidic-woody, intense red cherry floral aromas and flavors, a natural sense of cacao sweetness follows, accompanied by nut and floral top notes, a hint of cardamom, finishing with vanilla and bitter coffee." Unless you have a very attuned palate, I wouldn't expect you to taste all of those notes--especially considering the somewhat low cacao percentage. Here's how this chocolate is to me. On removing the chocolate bar from its clear wrapper, I find that the aroma has a bite to it, hinting at some bitterness. But this is not so. The one word that describes this bar is smooth, quite the opposite of bitter. Smooth mouthfeel from start to finish and smooth flavor, as well. Not strong or biting at all. It has a bit of sweetness because it is what I generally consider a milder dark chocolate (70% or 75% is where I place the average), with fruity notes. I would perhaps agree with the cherry notes. The flavor is also in many ways a basic chocolate flavor--so if you're one of the people who likes to stick with chocolate that tastes primarily of chocolate (as opposed to all the complicated flavor notes), this may be a chocolate for you. It has layers of flavor--but it sticks pretty well to cocoa. 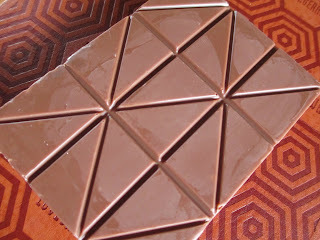 It's also just right if you want neither a sweet nor very dark chocolate, nor something middling and bland. This chocolate melts slowly, softly, smoothly, as if it will keep melting forever; the consistency is very smooth without being plasticy. It finishes off nice and tender. A classic chocolate, very nicely carried out. In fact, it's quite gorgeous. Sometimes I like to introduce people to new types of chocolate just so they can experience them--but this I would give to friends just because I think they would really enjoy it. It's like the dark chocolate version of Theo's 45% Creamy Milk Chocolate--not because they taste the same, but because of their wonderful edibility that is still combined with ethics and quality. Those three traits make for a winning chocolate. Sometimes it has seemed odd to me how much power Tarkin seems to have in A New Hope. Isn't Darth Vader, under the Emperor, the one who is in charge? And yet Tarkin seems to be calling a lot of the moves and exerting much of the authority; Leia even says that she "should have known he was the one holding Vader's leash." So how did he come to be in such a high position? That's the question that James Luceno's Tarkin sets out to answer. Who is Tarkin, what's his background, how did his character form, and how did the Emperor and Vader come to give him so much authority? I'm not as interested in the military or battle side of Star Wars, so when I was planning to read all of the new canon books, I almost thought about skipping this one. It kind of just seemed like a floating story about a character I wasn't really that interested in. But, you know, I'm glad I didn't skip it. Tarkin's back story is worth the read; in fact, the flashbacks were my favorite parts of the book. A little creepy at times, perhaps, but that's how you get as ruthless a character as Tarkin, isn't it? 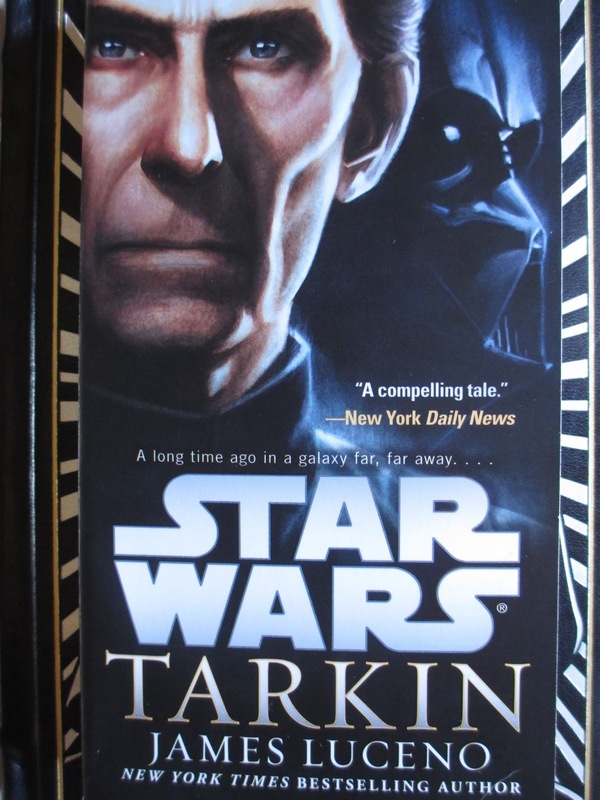 The plot has to do with the growth of the partnership between Tarkin and Vader as they chase down a group of saboteurs and try to figure out what their goal is. Along the way, you get a taste of just what the rebels of the OT were up against as they took a stand against the Empire. And you see why Leia reacted the way she did to Tarkin: he's the link between Vader and the Empire's subjects. The Emperor gives Vader the commands and then Tarkin figures out how to carry out all the little details. This is how the Empire became so strong. Last Friday morning, Out of Africa Wildlife Park welcomed a new baby zebra--so naturally I had to go and see her on Saturday. As of Saturday, she was still unnamed; I'm not sure if that's changed by now. You can see her when you go on the Safari Tour (which is also where you can feed the giraffe). I was a little worried that she would be away from the tram, but we drove right by mother and baby. Have you ever seen a day old zebra in person? I wasn't exactly prepared for how beautiful she would be. And then, while we were stopped beside them, she stood up. A little wobbly like Bambi while standing, but pretty sturdy once she got up. Adorable. There is also a five month old (I think I have that number right; I know I saw that one at one month old earlier in the year) at the park; I didn't take that zebra's picture this time, though. It kind of feels like meeting a new friend, someone I know I'll be coming back to visit many times to watch grow. Here also is the obligatory Tiger Splash picture (with Chalet again). I usually try and get one decent picture during the show. And speaking of watching friends grow, have you seen Sycamore lately? He's their year-old Grizzly (he turned one in January). He's growing into quite the energetic little (or big) bear; now they have playtime with him--dressed up in bear, tiger, and mammoth suits. That's right, the picture below is a man in a bear suit racing a Grizzly bear. And Sycamore seems to love playtime with his friends. At the end, you still get to see Sycamore drink his bottle: he's still young, despite being quite big already. Goodness he's grown since I last saw him in Wonders of Wildlife (I think that was back in November: it's an afternoon show that I don't always stick around late enough for--well, the last time I was going to, it started pouring and I decided I'd rather just leave than get drenched and struck by lightning to see a bear drinking a bottle, though maybe it would have been worth it?). Out of Africa, you're a place like no other. Some chocolates are like people: you have the feeling that you already know them, or at least that they remind you very much or someone else you once knew. 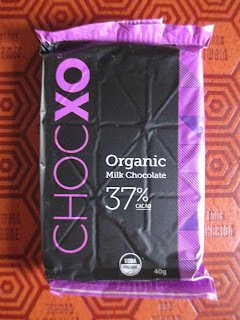 That's how ChocXO's 37% cacao Milk Chocolate is: so familiar, like something I have tasted before but can't quite place. In the town of Carlsbad, about 45 minutes above San Diego, is a place called The Chocolate Bar; they sell coffees and hot chocolates, desserts, truffles, and an assortment of other candies and chocolates. There I found a selection from ChocXO, a company based out of Irvine, CA that I had never heard of and therefore had to investigate into. This was one of those occasions where I felt inclined to choose the milk chocolate over the dark chocolate. I can't say why exactly; that was just what I felt like choosing. Anyways, a milk chocolate is generally as good of a marker of a company's talents as a dark chocolate. As usual when a chocolate has to travel home with me, this poor little 40 gram bar went through a little wear on the way, and yet when I unwrapped it I still found it quite a sight. Is it just me that thinks this chocolate is a beauty? The design is simple: nine rectangles divided by criss-cross lines in alternating directions. Yet I find it perfect. 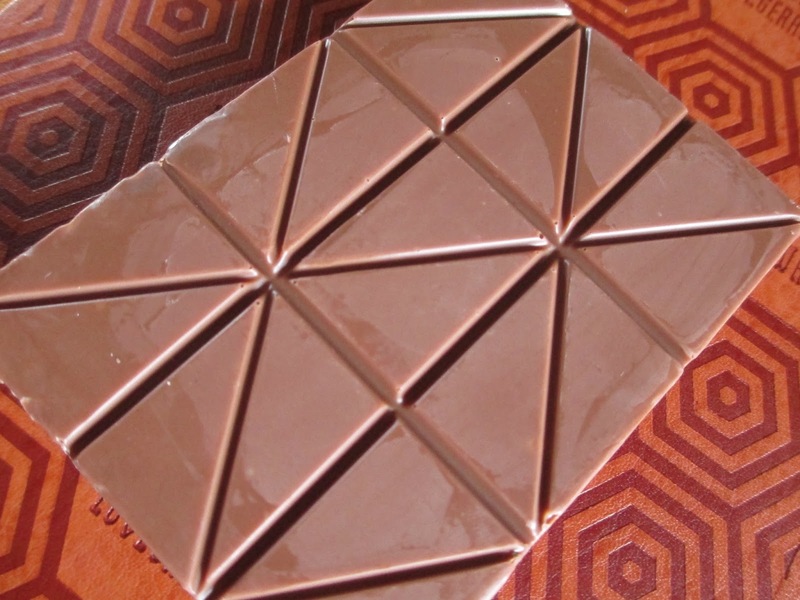 Maybe it's because I like chocolate bars that divide into small pieces, and yes, you can break this chocolate along all the lines to create a set of 18 little triangles if you so choose. Strongly fragrant, this chocolate tastes of vanilla, resulting in a caramel nuttiness that reminds me so much of another chocolate. I just can't be quite sure of which one. Or maybe that should be plural: the taste may be the flavor generally belonging to generic milk chocolates sold in the U.S. that are labeled as being made in Belgium. Yes, I think that may be it: that high vanilla content and that nuttiness, that's where I've tasted them before. I don't mean exactly to call this bar a generic chocolate. 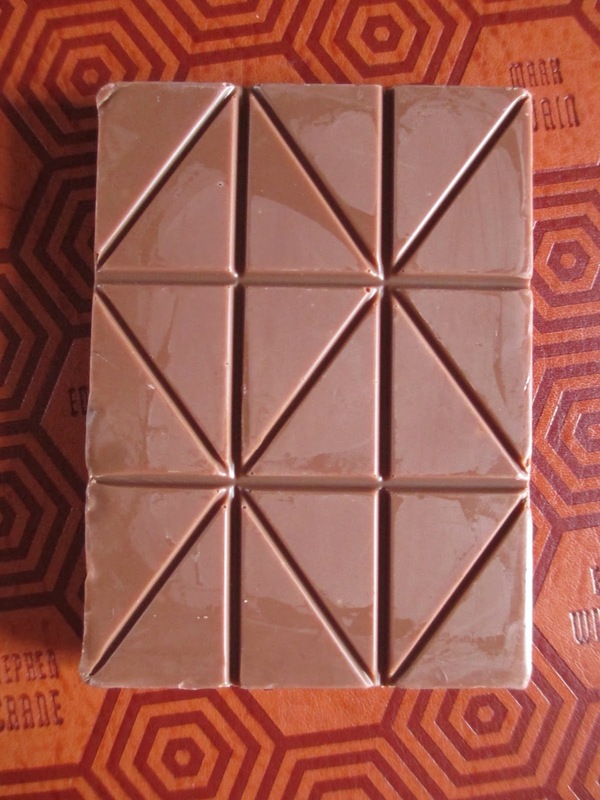 Because here is the thing: this is bean to bar chocolate made with all organic ingredients. Just cane sugar, cocoa butter, milk powder, cocoa paste, and vanilla. And that's the preferred way for chocolate to be, whether you're craving a complex dark chocolate one time or a simple milk chocolate another time. It's important that chocolate can be made with quality and integrity no matter if it is intended to be complex or simple. 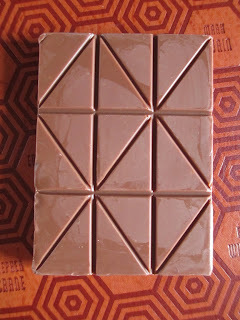 This is a simple milk chocolate, creamy and sweet, and yet it is made with organic ingredients. Though I keep calling it "simple," this is a stellar replacement for candy bar chocolate and yet it'll still satisfy those cravings for something sweet, while also being a better thing to purchase. Yes, I paid $4 for 40 grams, but you can easily split this bar into three sections if you find the price a little high. 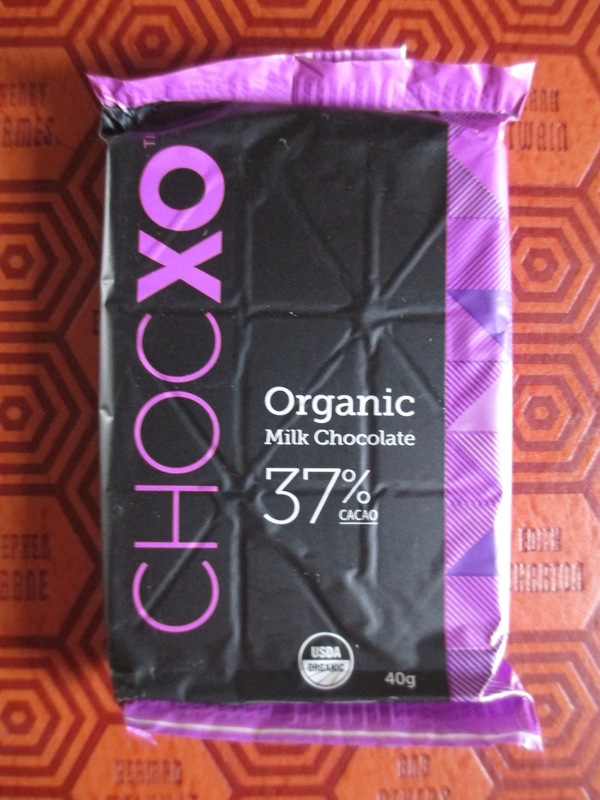 And ChocXO is smart for keeping the bar size down: $4 is less intimidating than $8 for a larger, 80 gram bar. The milk chocolate passes the test. Now I find myself curious about the dark chocolates that I left behind--but it isn't as if I can rush back to Carlsbad for them. Until next time then. When in the time of summer, it is sometimes nice to go off to the cooler zones--that is, to Flagstaff. I've always had mixed feelings about Flagstaff: while the blue and green, the mountains and the trees are beautiful in summer, I wouldn't want to live there because they get snow in winter. Snow is nice--but not having to deal with it every day. In summer, though, Flagstaff feels so nice and cool compared with the more central regions of the state. I think the high temperature was about 80 or 81 this past weekend when I was there. And if you'd like even cooler weather, head up to the Snowbowl: in summer, the ski-lift operates as a scenic chair-lift up the San Francisco Peaks. I think the temperature was around 70 at the base and another ten degrees less at the top. One of the only times you have to use a sweater (or jacket) during summer. It's about half hour up and then another half hour to go back down; you can go on some trails when you get to the top, or just look around and make your way back right away. When you're at the top looking down, it's amazing how high you are: the Peaks are visible from quite far away, after all. So when you're on top of them, you can also see things far, far away: mountains and hills that are barely recognizable because of the distance. So much blue and green. We made our way over in the morning to try and avoid afternoon rain--but what happened when we got to the top? We were watching the clouds, guessing about how long we had until the rain started while we waited in the (short) line to go back down. And it started raining on us. And then it hailed. And then suddenly the line behind us was much longer, most of the people deciding they would rather go straight back down than linger on top of the mountain so near to the clouds. The rain continued until we were, oh, about two-thirds of the way down. So perhaps I didn't continue looking out at the view as much--but the rain did make the ride much sillier. 1) Cameo Rings - Usually when I see cameo rings, they're either too new or too big, so when I found these two together, I had to get them both. They're from a little antique store in Carlsbad called Olde Ivy Antiques that usually has good things. With my non-expert eye, I would guess that the brass and black ring is older--and it's probably my favorite, too, though I do like them both. 2) Harney & Sons Paris Tea - Whenever I'm around San Diego, I have to go to Rust General store in the Historic Old Town District: they have food (mainly of the seasoning and sauces type), chocolate, and tea. I don't know of anywhere near where I live that sells Harney & Sons tea. Last year I got the vanilla kind, and this year I chose Paris, which is a black tea with fruit, citrus, and vanilla. It is a tea after my own heart, absolutely lovely. 3) Her Universe: High Commander Cardigan - I've been waiting to get this sweater since Spring: I wanted it when it first debuted but by the time I'd set aside the money for it, it was out of stock in my size. But now I have it in time for Fall. I love how subtle and yet recognizable it is: it's just a plain sweater and yet it's just like those uniforms in Star Wars. 4) Wooden Notebook - This one came from a different shop in Old Town San Diego, after I had already made all the purchases I'd planned. But I love wood and I love notebooks, so how could I resist a wooden notebook? 5) Paqui Tortilla Chips: Very Verde Good - I found these at Whole Foods; they're basically like Cool Ranch Doritos, only much, much better. They're so good it's ridiculous: I have an extremely hard time stopping eating them and I'm not one for big portions of the same thing at one time. Basically they have the taste of green salsa and cream on a tortilla chip, but you just have to try them for yourself to see what I mean. 6) Oaxacan Animal Figures - Making the fourth and fifth addition to my collection of green Oaxacan animals, I got this little dog and the rooster at the Pueblito Cuetzalan corner of the Marketplace-style store in Old Town San Diego: I generally find that they have the best figures there. 7) Montana: Caitlyn Shoes in Mahogany - Okay, so I haven't really worn these shoes yet--but how could I resist showing them off? They're going to be my cool weather shoes, perfect for wearing with tights, a skirt, and a sweater. I was laughing because I was looking in the Dillard's shoe department and showing no interest in any of the shoes until I got to the "comfort shoes" corner--which might also be considered the old lady section--and there I was finding various shoes I found cute and would consider wearing. Really, everyone, don't wait until your feet and knees start to hurt to wear comfortable shoes: start now so that you won't be as bad off later on. And, anyway, I like the look of this shoe--I consider it more vintage than old lady (and I am kind of an old lady in certain things, anyway). 8) Huckleberry Jam & Creamed Honey - Old Town San Diego's candy store is one of my stops there: I like to get a few candies and some huckleberry products. The huckleberry caramels are good; the truffles don't interest me anymore. Last year I got a little jar of the jam and was planning to buy a bigger one this year until I saw the creamed honey. So I stuck with the small jam jar and added the honey, and I am so glad: the jam is good but the honey is very good. 9) Oberon Design Barrette - I've been eyeing Oberon products for a little while now--do you see why? Such artistry in the design. I can wear this piece on a casual day or even a more formal day: it fits for any moment. 10) Dinosaur Bookmark - I also got a bookmark in San Diego. Now, I used to not like bookmarks: years ago I would use ribbons and then I went to thin slips of paper. Then I thought maybe I'd like to try a bookmark again, and then I saw this one, and once again, how could I resist? Years ago, I used to have a cat and a frog in this style; it's kind of nice to go back to the familiar shape. 11) Herb Teas - In the Historic Old Town District, there is a sort of main museum store. Though the gift shop is small, I usually try and buy something just in support of the place. This time I picked up a book and the sampler bag of teas. They're grown (I believe) in the district and they're put together the way that people in the past would have made them. There are four flavors in the sampler bag: Lemon Verbena, Zesty Lemon, Ginger, and Chamomile. Though they're simple, they have some ingredients I don't expect to see in tea, like thyme. The effect of each blend is almost surprisingly nice; I've enjoyed drinking them while watering outside in the evening.